Modern piracy has a documented trajectory since 2008 that demonstrates an escalation in severity. Four regions are responsible for the recent trend (Hanson 2010 & U.S. Department of State): 1. Somalia and the Gulf of Aden 2. Gulf of Guinea Nigeria and the Niger River delta 3. Malacca Strait between Malaysia and Indonesia 4. India and Sri Lanka. The International Maritime Bureau's (IMB) Piracy Reporting Center has tracked piracy since 1992. In 2008 Somalia pirates seized a cargo of Russian tanks and an oil supertanker. Piracy then became an international media subject. In 2009 concern lead several countries to deploy their navies to the Gulf of Aden. In April 2009, the U.S. Navy, in a rescue operation deployed a sniper to kill three Somali pirates, and take one captive after a seizure of a U.S. cargo vessel. In October 2009, piracy activity had surpassed 2008 levels (Hanson 2010). The threat of armed escalation brings unknown costs to the international community. Hanson quotes expert John S. Burnett and work Dangerous Waters: Modern Piracy and Terror on the High Seas, "one attack on the wrong ship at the wrong time" could result in "the closure of one of the strategic international waterways upon which so much of the world economy depends"(Hanson 2010). There is no designated lead agency or framework to interpret and promulgate data related to crime in international waters. The lack of a reporting system facilitates a downplaying in the violence faced by seafarers and under reporting the number of attacks against smaller vessels and fishing boats. United States President Obama issued Executive Order 13536 on April 13, 2010. This order is ambiguous and criminalizes any act of providing financial aid to any actor classified as a Specially Designated National (SDN) by the Office of Foreign Asset Control (OFAC). This Order is directed at the peace and stability of Somalia (Mart 2010). It is clear that emergence lends itself to complexity. The criminal acts of piracy exposed jurisdictional defects and in consequence the lack of deterrence, and overall vigilance against these actors and has empirically measurable international economic and human costs. International maritime piracy as an expanding concern has created disruption of trade between Europe and Asia. Every year 33,000 vessels are captured in the Gulf of Aden alone (Marts 2010). The increasing uncertainty over the prompt delivery of goods is hampering confidence in the marketplace along with the lack of volition by governments to act decisively (Bensassi and Martínez-Zarzoso). From the economic point of view, piracy affects international trade through this increase in insecurity related to the prompt delivery of goods. The recent seizures of vessels off the Cape Horn of Africa by actors operating out of the country of Somalia has demonstrated the lack of coordination at the international level to deter criminal activity. Researchers "found robust evidence indicating that maritime piracy reduces the volume of trade; the effect of ten additional vessels hijacked being associated to an 11% decrease in exports" (Bensassi and Martínez-Zarzoso). Should a state pay a ransom or not to maritime pirates? The pro ransom position advocates the use of all means available to decrease immediate threats of violence and catastrophe. The maritime industry is currently paying ransoms. In the greater view they hold that paying ransom limits their liability, as violence against crew members, and possible environmental catastrophe (Marts 2010). The antiransom position advocates use of all means available to limit acts of piracy over the long run. State actors and private persons argue that ransom payments escalates and reinforces maritime piracy. This escalation could rise to an antecedent for a military intervention (Marts 2010). There is variance as to the net costs to piracy. On the lower side of the scale is $1 billion. The higher end is $16 billion. One Earth Future (OEF) Foundation, under Anna Bowden has lead a large scale study to discern the total cost of piracy within it's Oceans Beyond Piracy project. OEF states piracy extracts costs to the international economy of $7 to $12 billion per year (Bowden 2010). OEF has studied primary and secondary costs (macroeconomic) to reach their conclusions. Their study focused on the supply side costs to both private industry and government. The analysis perviewed the Horn of Africa, Nigeria and the Gulf of Guinea, and Malacca Straits. Bowden surmises That the costs of Somali piracy figure prominently as this region is where contemporary piracy is most highly concentrated and where there is more credible data (Bowden 2010). The table below itemizes the conclusions of Ocean Beyond Piracy's Study (Bowden 2010). Ransom develops primary costs very rapidly. Pirates in 2009 were successful in 52 attacks and received $177 million in ransom for an average of $3.4 million. In 2010 there were 44 successful piracies netting $238 million averaging $5.4 million dollars each. Therefore the total costs for these two years alone was $415 million (Bowden 2010). In 2005, ransoms averaged $150,000. Then in 2009 the average was $3.4 million. In 2010, ransoms were on target to average near $5.4 million. In November 2010, the highest ransom payment delivered was made by South Korean concerns to Somali pirates for the release of the Samho Dream. The cost was $9.5 million for the oil tanker. The escalation in ransom demands support the anti ransom posture that payment reinforces the behavior (Bowden 2010). Insurance and rerouting adds costs pressures to those concerns. There are four issues involving insurances: 1. war risk 2. kidnap and ransom 3.cargo 4. hull. Lloyds Market Association (LMA) Joint War Committee in May 2008 classified the The Gulf of Aden as a war risk. War risk premiums have increased 300 times from $500 per ship, per voyage; towards $150,000 per ship, per voyage, during 2010. Kidnap and ransom premiums usually cover only the crew. Cargo premiums are estimated to have risen from $25 TO $100 per container. Hull insurance may cover any damage to the ship from piracy, weather, or sinking. These costs have been estimated to have doubled (Bowden 2010). The OEF has calculated rerouting costs for a 10,000 TEU (Twenty Foot Equivalent Units shipping container) and a 300,000 DWT (Dead Weight Tonnage) VLCC (Very Large Crude Carrier), to model the costs of rerouting each size vessel (Bowden 2010). A firm that reroutes a tanker from Saudi Arabia to the United States around the Cape of Good Hope, will add 2700 miles to the voyage. Sailing from Europe to the Far East will add six extra days to a journey for a liner and 15 to 20 days for a large cargo vessel. This time cost will lessen a ship's voyages from 6 to five with a 17% reduction in delivery capacity. The rerouting option is a consideration for those slower and more vulnerable vessels (Bowden 2010). As a point of departure two issues emerge when deliberating the lack of jurisdiction and legal deterrent in an overview of maritime piracy (Anderson). 1. 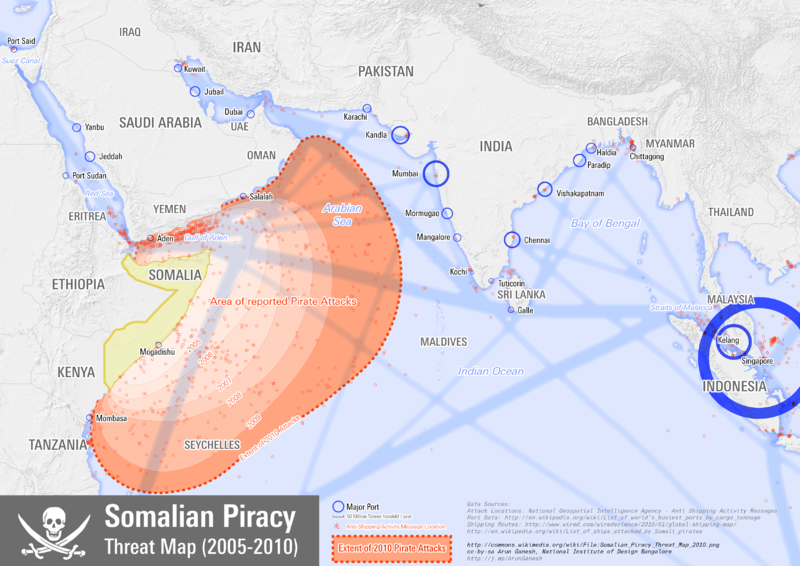 Somalia accounts for about 40% of piracy events that are executed near the Horn of Africa. Solving the Somalian problem will not solve global piracy. 2. Piracy is a distinct crime involving a complex nexus of other crimes which are subject to different jurisdictional and legal rules than piracy. Kidnapping, torture, assault, theft extortion, money laundering, and arms dealing are other events in the racketeered system of piracy. Anderson et al. has stated, "There is an international legal framework under the United Nations Convention on the Law of the Sea (Law of Sea Convention or UNCLOS) for the apprehension and prosecution of pirates..." (Anderson). Her workshop group surmises the "SUA Convention provides for the transfer of captured SUA offenders ashore and mutual legal assistance between States Parties to the SUA Convention" (Anderson p. 3). The issue is obstructed by practical challenges as security and impartiality of courts, human rights obligations, procuring evidence, and fear or prosecuting pirates in that they will be forced to grant asylum to the pirates family upon conviction and sentence has been served (Anderson). A jurisprudential issue also exists. Is modern piracy terrorism? Terrorism are crimes that are created to intimidate and cause fear in a larger population. The UN Convention on the Law of the Sea, defines piracy as "any illegal acts of violence or detention, or any act of depredation, committed for private ends by the crew or the passengers of a private ship or a private aircraft" (Hanson 2010). Piracy and terrorism may have an overlap in the legal arena. Pirates and terrorists are non state actors. According to the Law of the Sea, piracy must occur on the high seas, outside territorial boundaries, and outside the jurisdiction of any state (Hanson 2010). In light of alleged financial connection of pirates and fundamental Islamic groups a new legal definition of piracy terrorism is justified. Bruno Schiemsky, one time head of the UN Monitoring Group on Somalia, stated in Jane's Intelligence Review pirates have provided training to the maritime branch of al Shabaab. al Shabaab has also been using pirate groups for arms smuggling (Hanson 2010). The OEF believes it is conclusive that universal jurisdiction exists for piracy, based in international customary law and the Law of the Sea Convention. This would give authority to any state to prosecute maritime piracy. Bowden and the OEF stresses that this straightforward legal definition in a very strict sense. Here is a portion of the Convention (Bowden p.7). In Article 100 of UNCLOS it is stated: "all states shall cooperate to the fullest possible extent in the repression of piracy on the high seas" (Bowden p.8). Article 105 indicates that a sovereign carrying out the seizure may try the arresting pirates. The right to try the suspects may also rest universally to all states. Universal Jurisdiction gives jurisdiction to all states. Hence the flag state of the pirate's ship could also be a jurisdiction for trial. Many perceive the duty to arrest and try pirates as state duty in which there is widespread delinquency (Bowden 2010). It is clear that pirates have forced actors to divide the question increasing the pirate's short run success. The area off Somalia is lawless although the UNCLOS has given authority for states to act. The pirates have shown prowess in being successful in scoring ransoms increasing the average ransom from 2005 from $150,000 to $3.4 million in 2009. The upper boundary of costs to the world is $16 billion dollars per year. AP Moller-Maersk, Europe's largest ship owner, has diverted all 83 tankers. The Odfjell shipping group with a fleet of 90 tankers, and Frontline, a major oil carrier company have all diverted (Bowden 2010). It is also clear that a universal legal nomenclature is needed for the terms piracy and terror. This means cooperation at the multilateral level, although this does not deter a state actor from defending ships under it's flag. Benassi states transparency here means overt measures "declared to be taken to fight insecurity" and enforceability implementing those measures affect the degree of security enjoyed by a country. Transparency has the highest the trade volume (Bensassi and Martínez-Zarzoso). Most ships are relatively defenseless: and crews seldom carry weapons...they depend on ...carpet tacks spread on decks, fire hoses, deck patrols, dummies set at night, brilliant deck lights, and new satellite tracking devices...(Ball p. 450). The pirates have successfully initiated their opportunities, the lack of a coordinated response and will is a balanced benefit to cost trade off between ransoms, diversion, and emerging systems of deterrence all of which are creating an unstable international business atmosphere in certain regions and encouraging pirates to act in others. Ball, D. A., Geringer, M., Minor, M., and McNett, J. (2010). International Business: The Challenge of Global Competition. 12th ed. New York: McGraw-Hill Irwin, 2010.